DONETSK, Ukraine -- On the eve of the presidential election, Sky News met pro-Ukrainian paramilitaries training in the country's southeast, preparing to fight the separatists who have taken control of large swathes of the region. Members of Ukraine's Azov Battalion who say they will fight to keep their country together. The men of the Azov Battalion seemed wholly unconvinced Sunday's poll would bring peace, or anything close to resolution. They told us they have no plans to disband after the vote. They prefer to put their faith in the Kalashnikov than the ballot box. One platoon commander told us he wants another revolution. He said that neither Petro Poroshenko nor Yulia Tymoshenko (the current presidential frontrunners) are fit to lead the country and take on the mantle of maidan (the local name for the winter's uprising that started on Independence Square). Another said he had no choice but to become a soldier now - to fight for his family and for his homeland. We filmed them at a training camp close to the southern border of Donetsk region, at a location we agreed not to disclose. Getting there involved meeting a man named Ihor at a designated train station then following a car with no number plates through the Ukrainian countryside, which incidentally was waved through a police checkpoint without a second glance. The men arrived in two buses and a pick-up truck - all in combat gear and balaclavas; carrying a variety of assault rifles and handguns. Some had what looked like military-issue boots; the others a selection of trainers and walking boots. Many had small blue and gold Ukrainian ribbons pinned to their uniforms, several had arm patches with the black and red nationalist flag. They wouldn't say where the weapons had come from, or who is funding them, beyond that "lots of patriots" had donated to the cause. 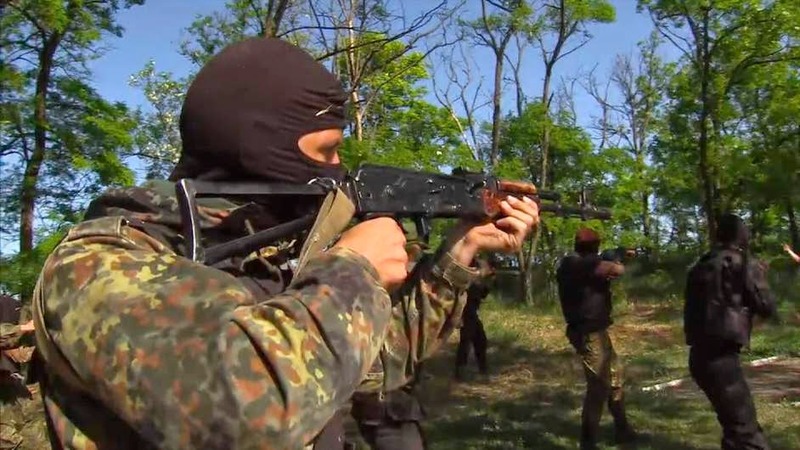 The Azov Battalion is one of three new paramilitary units - operating outside the Ukrainian army and the national guard, but with the approval of the Ministry of Internal Affairs. To the north is the Donbas Battalion; to the west the Dnipro - the latter funded by governor/oligarch Ihor Kolomoysky. The men of the Azov told us they are all volunteers - the majority of whom are local to the south and east and have worried families at home. They come from a variety of backgrounds. A quick sample revealed three businessmen, a graphic designer, a construction engineer, two students and a cook - all spending their Saturday afternoon learning how to over-run a checkpoint and practising live firing drills. There was a disagreement at one point about how they should be training, but no dispute about what they were preparing for. All believed they were now fighting for the future of their country - few trust the politicians to deliver.